Harley’s ready for some fun times. 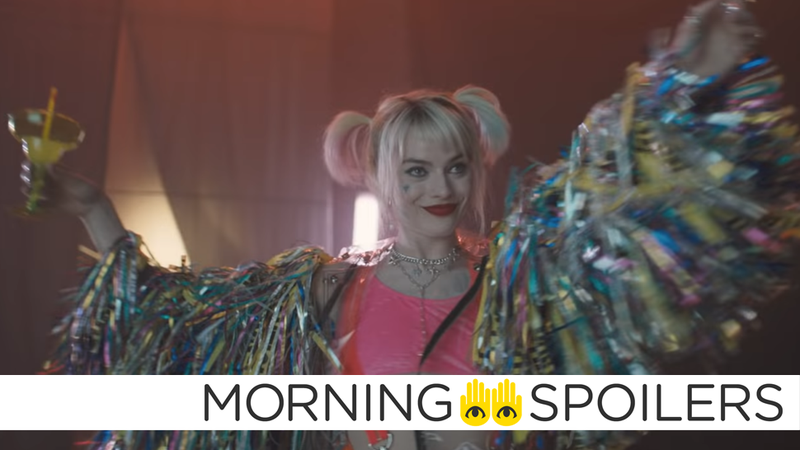 New set photos reveal another getup of Harley Quinn’s. According to Revenge of the Fans, Rene Russo will allegedly reprise her role as Frigga in Avengers: Endgame. The outlet also has word Ken Jeong has been cast in a currently undisclosed role. Deadline reports the RZA will direct a film written by Ghostface Killah concerning a supernatural serial killer in Staten Island. The Babadook director Jennifer Kent revealed she’s “got something on the boil” with producer Guillermo del Toro in a recent interview with Bloody-Disgusting. Look, we’ve got something on the boil. I’m not being secretive but I’m not sure I can talk about it. It’s something scary and I really admire him and his work. I think he’s a true artist so I’m excited to know more. We’re in [the] early stages of that. Speaking with Rolling Stone, Jordan Peele specifically clarified Us is a horror film, and should not be misinterpreted as a “social thriller,” like Get Out. I’m such a horror nut that the genre confusion of Get Out broke my heart a little. I set out to make a horror movie, and it’s kind of *not* a horror movie. As a horror fan, I really wanted to contribute something to that world. Appearing as a guest on Watch What Happens Live With Andy Cohen, Billy Eichner revealed Beyoncé and Donald Glover perform “Can You Feel The Love Tonight?” as a duet in the live-action Lion King remake. I play Timon, and Timon and Pumba start singing ‘Can You Feel The Love Tonight,’ and then it segues into Beyonce and Donald Glover singing it. Danny DeVito also revealed how Dumbo gets his name in a new interview with Screen Rant. What I found was really great was the mama elephant, Mrs. Jumbo, and baby Jumbo, ‘cause you know he doesn’t get his name Dumbo until they... there’s a big brouhaha in the tent and the “J” falls and the “D” falls. I don’t know if that’s in the... this is different. This is more of a Tim Burton-esque way of doing it, it’s really cool. Alita descends into the underworld in a new clip. After coming to an “impasse” with Netflix, Rob Liefeld stated he will be taking his Extreme Universe characters elsewhere. In a since-deleted Instagram post (saved for posterity by Screen Rant), film hair designer Debra Johnson shared a camera test of Conor Leslie in her official Wonder Girl costume. Head on over to the link to see! Dreamer also debuts her new costume in the trailer for “Menagerie,” next week’s episode of Supergirl. Hynek and Quinn follow a series of strange clues leading them to a secret group of people who not only claim to have witnessed strange lights during combat called Foo Fighters, but also claim to know a way to contact them.